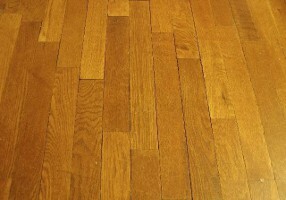 There is no doubt that wood floors can add a beautiful touch to any home and that it can often help increase resale value; however, knowing whether to choose solid hardwood flooring vs engineered hardwood flooring can be a little confusing, at least until you take some time to understand the advantages and disadvantages of each. 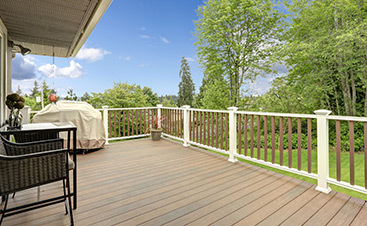 Solid hardwood planks are milled from a single piece of wood, typically 3/4″ thick and then treated with a protective coating. 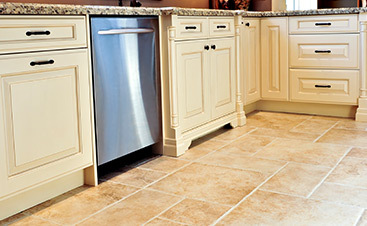 These floors can be sanded and refinished numerous times over the life of the floor, allowing homeowners to keep their floors looking great, year after year. However, one drawback with solid hardwood floors is that they can expand and contract as the relative humidity in your home changes. Maintaining an indoor humidity of 45% to 65% is important to help protect solid hardwood flooring. In order to prevent warping or other damage, installers generally leave an expansion gap around the perimeter of the room which helps compensate for some expansion. This small gap is easily covered with a base molding. Due to the potential damage that could occur if solid hardwood flooring is exposed to moisture, it is typically only recommended for use in areas that are above grade. Engineered hardwood floors are made by bonding together several pieces of wood, generally 3 to 5, where only the top veneer layer is hardwood. The hardwood surface is then backed by less expensive substrates, such as plywood or even recycled wood fibers that are mixed with ground stone for added durability. 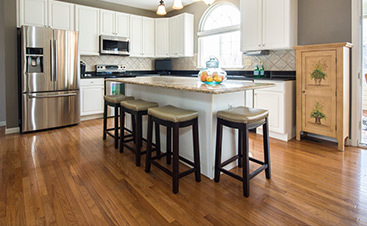 Engineered hardwood floors are manufactured using pressure and heat, so they are less prone to damage from humidity. This makes them more suitable for humid areas or rooms that are below grade, provided that an appropriate moisture barrier is used. It is also possible to get engineered hardwood planks that are made with tongue and grove, making them easy to install since no nails or glue are needed. Additionally, because they are less likely to warp, engineered hardwood floors can be installed on any level. They are also the preferred choice for rooms such as kitchens or bathrooms, because of the likelihood of being exposed to moisture or humidity. When trying to choose solid hardwood flooring vs engineered hardwood flooring, some important factors should be taken into consideration. For example, engineered hardwood floors can be installed over concrete, OSB, plywood or wood, whereas solid hardwood flooring cannot be installed directly on top of a cement subfloor.